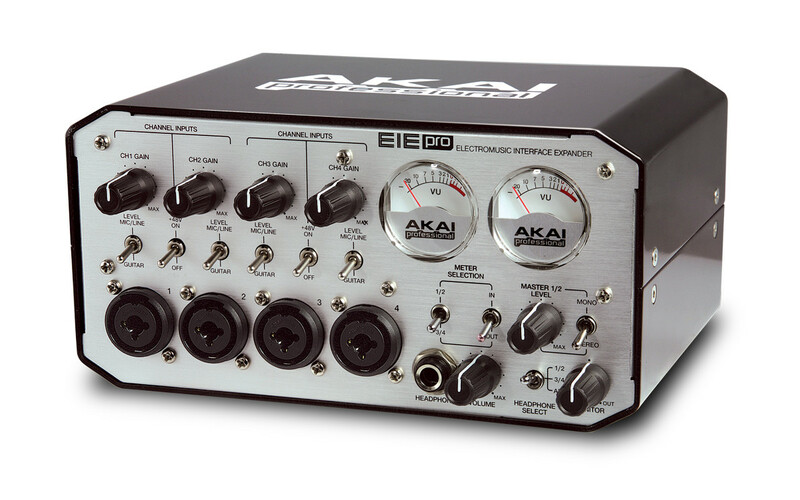 Akai Professional now ships the new EIE Pro digital audio interface and USB hub. The EIE Pro is a tabletop audio/MIDI interface with USB hub in one box to connect any kind of music gear. The USB audio interface on the EIE Pro is tailored for project and portable studio setups. This four-in, four-out (4x4) device is designed to enable professional recording at up to 24-bit resolution and sample rates of 44.1 kHz, 48 kHz, 88.2 kHz or 96 kHz into a DAW, recording or performance software on a Mac or PC. The EIE Pro also houses three USB inputs, in addition to its main USB port, enabling it to connect to controllers, hard drives or other peripherals when native ports on a computer may be limited. The compact recording audio interface features components including nickel-plated input jacks, analog-style VU meters and an aluminum casing. Each channel of the EIE Pro digital audio interface has a XLR-¼” combo jack, gain-pots and Mic/Line/Guitar switches. The EIE Pro features four preamplifiers with 48V phantom power. Individual ¼” TRS Nickel-plated jacks found on the back of EIE Pro provide you with channel inserts for processing audio signals externally. Inputs or outputs can be monitored visually with the analog VU meters providing classic features with modern style. The EIE Pro has a 1/4” TRS headphone output. A/D and D/A converters are featured. The EIE Pro USB audio interface sends and receives four audio channels on a single USB cable. The three additional USB ports allow the EIE Pro to function as a hub as well, bridging other MIDI controllers and hard-drives to the computer. The EIE Pro features traditional MIDI In and Out jacks for playing and controlling software with keyboard and pad controllers, workstations, and other MIDI-compatible instruments. 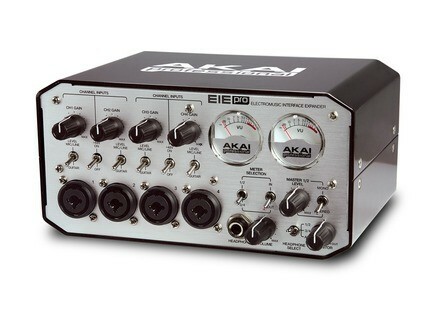 For more information about the EIE Pro, a new audio interface, visit www.akaipro.com/eiepro. Audio Damage Kombinat DVA Now Available From tone-shaping or adding a bit of grit to "total waveform destruction" comes Kombinat Dva, the sequel to the Kombinat plug-in. jBridge v1.4 Update jBridge has been updated to version 1.4. Sound Magic Rose Whisper Piano v1.5 Sound Magic has released Rose Whisper Piano Native Version 1.5, which applies a new designed NEO Hybrid Modeling Engine.